The Plextor PlexEasy PX-650US is an unusual device, it works as an external CD/DVD drive but its USP, is the ability to work as a standalone device to copy CDs, DVDs and to copy to and from USB devices, SD, and MMC cards. So it's ideal for anyone who regularly needs to backup data, without the need to resort to a PC. Apart from a two-line display, three buttons and an SD port the PX-650US looks just like a normal external CD drive, and it does all the things you would expect an external 8x DVD/CD writer to do. You can boot and read CD/DVDs from it, or use it as an external CD/DVD writer – you'll need to use the standard Windows software or some third-party software to write to the drive as the PX-650US doesn't come bundled with any specific CD/DVD software. However, it's the standalone features that really mark the PX-650US out from the crowd. Plug the device into the power source - you also have the option of powering it from a USB connection – and switch on, and you're promoted with "Copy Disk" on the two-line LCD display. You can then either, select other options using the Menu button, or navigate through the copy disk function with the yes and no buttons. If you select disk copying, then you're prompted to input a CD or DVD, and then almost immediately prompted for a USB memory stick. You'll need a 700Mb USB memory stick for copying CDs and a 5Gb or 9Gb USB memory stick for copying DVDs - depending on if you're copying a single layer DVD or a double layer DVD. In tests, the device took just under 8 minutes to read a 1.5Gb DVD to a USB and just under 5.5 minutes to copy it to a blank DVD, and around 280 seconds to copy a 550Mb CD to a USB and slightly less than 270 seconds to write the data to a disk. A nearly full 702Mb data CD took 300 seconds to read and 360 seconds to write to a blank CD. A nice feature is the PX-650US allows you to copy the data again once a disk is written, rather than re-reading the original CD, which is a particularly useful feature if you're always creating further duplicate backups for off-site storage. As well as copying CDs and DVDs the drive also allows users to write data from USB devices (including cameras, tablets PCs, phones and USB drives), SD and MMC cards directly to a CD or DVD. When copying from a USB device you can choose to select the entire device, or just individual files and folders. We tried copying some files from a Sony Ericsson Android mobile phone and a disgo Android tablet and it coped well with both. However traversing the entire file system of the tablet was quite time consuming, so while it's good to have the option, realistically we don't think too many people will use it. As well as burning and copying drives you can also set a few basic choices on the built-in menu including choosing to have the system verify data, close the disc, select individual files, erase the device after writing, as well as erasing RW Disks, and formatting USB, SD and MMC cards. One area that might be useful for anyone who's travelling with just a tablet is ability to rip music files from a CD to a USB key. In audio rip mode it takes a little over 300 seconds to rip a 550Mb CD, and 360 seconds for a 702Mb CD, there's unfortunately no choice on audio formats - it defaults to 141Kbps compression and produces standard WAV files - but most MP3 players should be happy with WAV files. 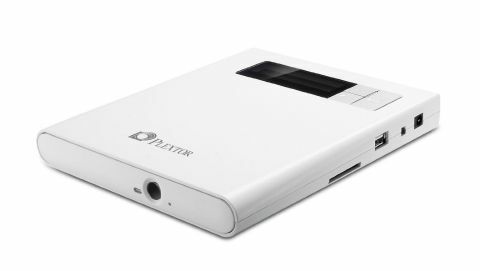 The Plextor PlexEasy PX-650US retails at around £85 which is around £50 more than a conventional slim-line external drive, however if you need a quick, PC-less, backup solution, or if you're always on the road then the peace of mind of having DVD and CD backups of all your valuable mobile/tablet/camera data should make this a must-have purchase.